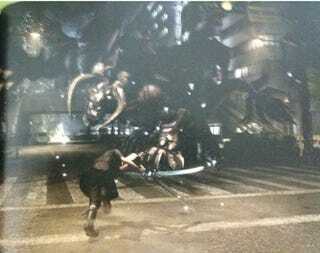 The first in-game Final Fantasy Versus XIII cutscene footage was shown at the 2008 Tokyo Game Show. It's now 2010. Let's see the first gameplay images. The latest issue of Japanese game magazine Famitsu has details about the PS3 title's gameplay. While the title is set in the same universe as Final Fantasy XIII, Final Fantasy Versus XIII has a different visual look and feeling to it. Versus XIII is an open world game, allowing players to go everywhere save for the mountains. Players can drive around in a car, which they can exit and explore the area on foot. Objects that are found on the road can be destroyed as well. It is possible to see some of the enemies that are wandering around, but some enemies will suddenly appear and surprise players.